On the innermost edges of the coastal dune belt lies a fascinating setting, peacefully enshrined in silence. Poetically named !Nomabeb by the local inhabitants – the ≠Aonin Nama or Topnaar – after the fig trees (Ficus sycamorus) that grow along the banks of the Kuiseb River, the place that is today called Gobabeb isn’t your ordinary tourist destination. 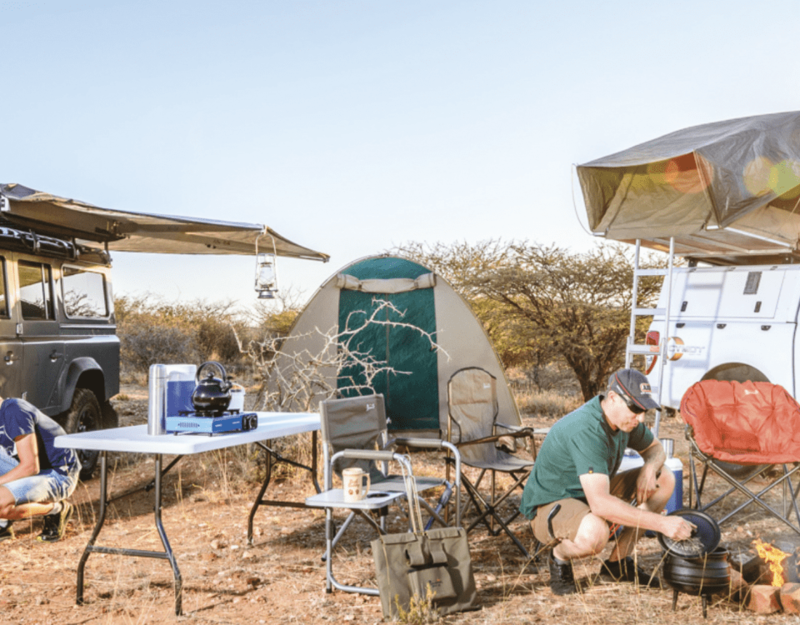 A t Gobabeb, situated between three ecosystems – the endless grey gravel plains, the predominantly dry Kuiseb River and the Namib Sand Sea with its shades of soft red flowing dunes – you will find a community of desert researchers. This group of dedicated people spend their days documenting the seemingly desolate landscapes, tracking weather patterns, interesting natural phenomena, geological formations, and behaviours and mannerisms of specially adapted fauna and flora. 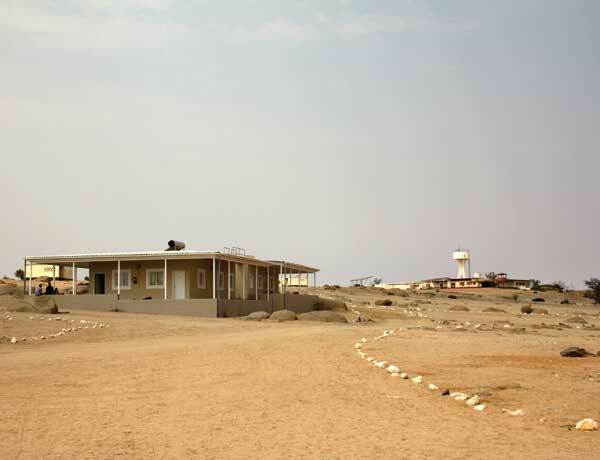 The centre has been acting as a scientific oasis in this dry, desolate landscape since 1962 when Dr Charles Koch and his team erected the first permanent structures. For many years it was only accessible to those in the know, invited guests, educational groups, or the misplaced traveller who stumbled upon its welcome gates, side-tracked on his way to a more popular destination. But recently all this has changed, as the doors to the desert centre opened up to all and anyone who wished to explore its silent shores. 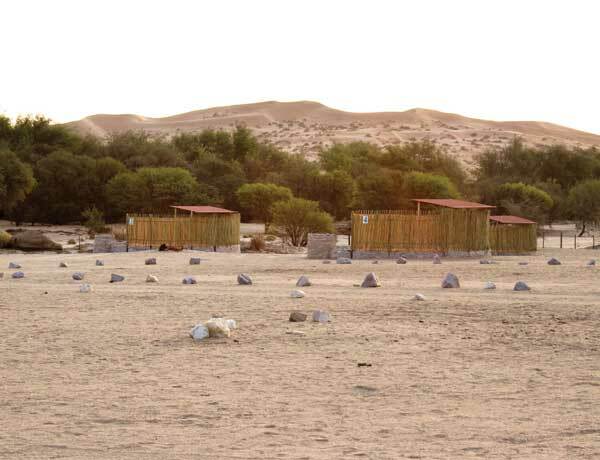 The dry patches of open land within the station compound, where tents were formerly only erected on an ad-hoc basis, now hold 10 private camp sites, neatly designed to protect campers from the wind and scorching sun. It overlooks the Kuiseb, tinted green with Ana, Acacia, Tamarisk and Wild Ebony, twittering with life as the birds sing their morning songs. Further up on the plain stand a number of 4-bed clay houses and 2-bed bungalows, designed to provide shelter against the weather, as extremes are known to rage outside these doors. With large wrap-around verandas, and positioned to keep off the midday sun, they invite to sit back and enjoy the endless vistas unfold far beyond where the eye can see. For larger groups there are also 3-bedroom villas with kitchen, lounge, dining area, bathroom, courtyard and garage. Apart from magnificent dune views from the porch, a party of pied crows promises to amuse the observer on the stoep, as they hop from tree to rock, talking in tongues and proudly showing off their clean white waistcoats. Accommodation units are either self-catering, or for those who’d like to take a break from the kitchen, chef Hendrik Adams and his team are prepared to lovingly cook up a storm and fill hungry bellies with the most delectable local cuisine (to be pre-booked before arrival). Originally from the nearest hub of civilisation, Walvis Bay, Hendrik has been feeding visitors to the Gobabeb centre since 1998, and apart from knowing exactly how to win over hearts with his cooking talent, he also knows the area like the back of his hand. Energy is provided through a hybrid system using off-grid solar power to supply energy-efficient appliances in rooms, communal areas, offices and even laboratories. This means that high-energy consumers like hairdryers are not welcome in the rooms. Other conservation initiatives, such as the ‘Desert Rat Shower’, are also intended to encourage a frugal use of precious reserves. Drinking water is treated by a new, highly advanced system of reverse osmosis and later passes through a trickle-filter system, which produces high-standard effluent. There are plans afoot to re-use this effluent for watering the vegetable garden to further conserve resources. If you’re searching for a bit more than what lies within the confines of your veranda, the centre offers informative station tours, and both guided and self-guided nature walks for those who want to learn more about this unique and untouched natural world. A night-time scorpion walk is another exciting activity to entertain night-dwellers, with the possibility of additional nocturnal sightings included if you’re one of the lucky ones. Visitors are welcome to further enrich their knowledge at the well-stocked library, which boasts the most extensive collection on arid zone research in ecology and biology in sub-Saharan Africa. Gobabeb is a place for nature appreciators, environmentally conscious travellers, and those in search of silence. The area’s rich natural and cultural heritage makes it stand out from any other place on earth, and if you’re into seclusion and learning about the secrets of the desert, then this is a destination not to be missed. Remember, Gobabeb is located within the Namib-Naukluft Park and general park rules apply, including the need to obtain an entry permit. Please do not collect any souvenirs – however tempting it might be – and bring your own firewood. Gobabeb is located 120km southeast of Walvisbay and about 300km from Windhoek via the Gamsberg Pass, and accessible on scenically beautiful gravel roads. A stay at the Namib’s very own research centre can be booked through www.staygobabeb.com or directly through the centre. Visit www.gobabebtrc.org for more information. There are 80 different tenebroid beetle species around Gobabeb. Geological formations around the area are dominated by schist, marble, quartz and granite. The Ana tree (Faidherbia albida), or queen of the Kuiseb, is dormant in summer, which enables it to tolerate low soil oxygen during the seasonal floods; it supports many animals with food through its protein-rich seeds, produced at the end of the dry season, and shelter as one of the tallest trees along the Kuiseb. The Camelthorn (Acacia erioloba), found on the banks of the river and further afield, has a root system up to 45 metres deep, enabling it to survive in arid conditions. The Tamarisk tree (Tamarix usneoides) can tolerate salt and its leaves change colour from green to grey over the course of the day as it secretes salt to limit water-loss. The spiky !Nara melon bush (Acanthosicyos horridus) has a taproot system of up to 50 metres. The fruit is a keystone ecological taxon and a favourite of many fauna in the area, including ostrich, gemsbok, jackal, gerbil and lizards. It is also an important source of livelihood for the Topnaar. 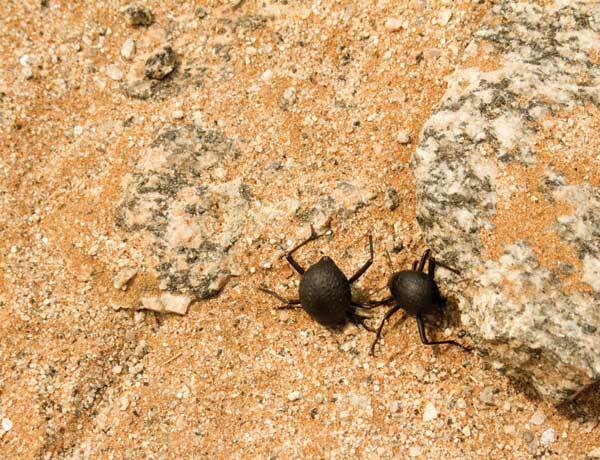 The area is home to the reputedly fastest running beetle in the world, the Onymacris plana, which can often be found avidly chasing after wind-blown detritus. The male Namaqua sand grouse (Pterocles namaqua) can store water in its breast feathers and travel up to 40km daily to bring this precious resource to its offspring. The side-winding adder (Bitis peringueyi) has adapted to life on the hot dune sands by moving its body in curving thrusts to minimise contact with the sand. It is so well-adapted to the desert that it does not rely on open water sources to stay hydrated, but rather gets its water from its food. 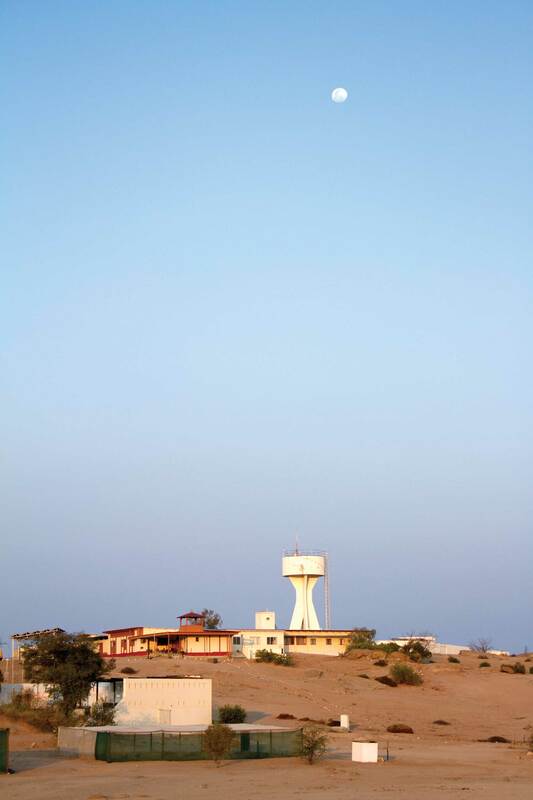 Knowledge-seekers might be interested to know that while guests delight in the views and tours offered at Gobabeb, the station remains fully committed to its role as a research institution. In its more than fifty years of existence, Gobabeb has conducted much of the existing research on arid ecology in this unique fog-fed desert, and up till today continues with a variety of research projects. Gobabeb’s researchers focus on maintaining the invaluable long-term data sets for weather and beetle diversity, as well as establishing novel projects. Some of the ongoing projects at Gobabeb include FogNet, an international effort in monitoring fog production and the fog-dependent biota in the Namib Desert, a project documenting lizard diversity and range throughout the Namib, and a multi-year project observing the growth and occurrence of Namibia’s national plant and “living fossil”, the Welwitschia, around Gobabeb. In addition to its core objective to host and practice scientific research, Gobabeb has also become a forerunner in advocating environmental education in Namibia. The other half of Gobabeb’s modern mission is training: Gobabeb welcomes nearly a thousand learners of all ages through its gates every year, from across Namibia and around the world, to introduce them to the incredible ecology. Students are taught the basics of scientific investigation. They take part in one of Gobabeb’s annual internship programmes, the Summer Drylands Programme (November-January) or Gobabeb Training and Research Internship Programme (February-June). Both programmes are intensive field courses which introduce Namibian university students to arid ecology and restoration. Sit back and enjoy the endless vistas unfold far beyond where the eye can see. 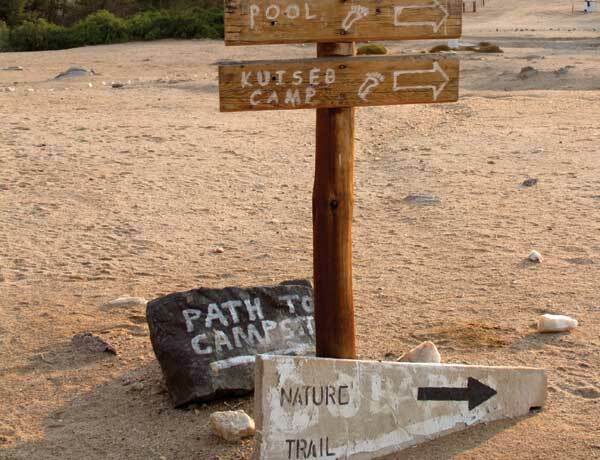 Campsites overlook the Kuiseb and dune belt. Explore this untouched natural world on foot.